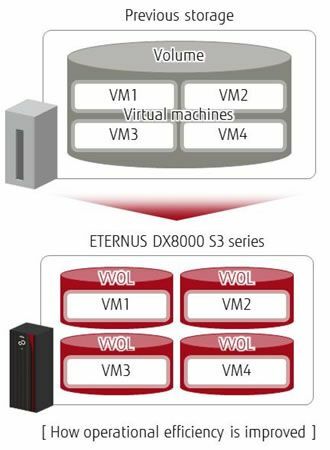 Fujitsu today announced the introduction of the FUJITSU Storage ETERNUS DX8000 S3 series. Global sales of the new series start today. 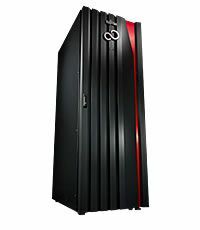 The three models in the ETERNUS DX8000 S3 series - the DX8100 S3, DX8700 S3, and DX8900 S3 - represent the pinnacle of Fujitsu's storage products, and are suited to a range of applications, whether maintaining or upgrading an existing enterprise system or building a new system for innovation from scratch. The DX8100 S3 model is only available in Japan. In addition to Fujitsu's technologies for high reliability, the new series incorporates performance improvements that make I/O speeds roughly eight times faster than its predecessor, and achieves world-class processing performance(1) , thereby supporting the stable operations of mission-critical enterprise systems and social infrastructure systems. The series supports the deployment and integration of storage for various business-oriented and information-oriented systems and improves operational efficiency due to improved responsiveness via new auto-tuning functionality and upgraded connection functions that make it easy to run backups and set up storage in virtual environments. 1) Improving controller performance and maximizing the number of controllers improves peak performance eight-fold compared to the previous model(2) , achieving world-class levels of roughly 4 million IOPS(3) . This outstanding processing performance ensures instant data utilization. 2) Newly added support for Extreme Cache(4) , an SSD cache built into the controller using the latest flash technology, greatly increases the rate of cache hits on read operations, resulting in a four-fold performance improvement in an internal comparison(5) . Using a large Extreme Cache alleviates loads at times of heavy access and can flexibly accommodate unpredictable changes in the environment. An automatic hierarchical-control function that redistributes data storage targets among disks and SSDs in response to access frequency is newly connected to a QoS function(6) that automatically adjusts internal storage resource allocation in response to performance targets, improving responsiveness. When targeted responsiveness levels are not achieved using the QoS function's automatic tuning, data is redistributed to high-speed storage targets using the storage automatic hierarchical-control function, which boosts responsiveness. This provides required performance levels in diverse access environments without complex performance settings. Support has been added for VMware vSphere Virtual Volumes(7) , which makes storage operations more efficient for virtualized server environments using the VMware vSphere virtualization platform. By simplifying storage settings, it had been the case that multiple virtual machines were stored in an equivalent storage volume and operated on a per-volume basis. This made backups and performance tuning for each virtual machine difficult. Using VMware vSphere Virtual Volumes makes it easy to set operations policies for virtual machines, such as backups and QoS, and using the vSphere Web Client interface storage operations can be optimized for the requirements of each virtual machine.